Unfortunately I won't be able to keep everything really seasonal, since most of them tend to be ready all at once, but that's life. This week, for the first time, I actually have a chamomile harvest to do--in the past couple of years it's been maybe a small handful of flowers total, but this year they went gangbusters. It's awesome. And they are totally easy to grow (otherwise I wouldn't grow them). And they are pretty, and they smell nice when you walk by. 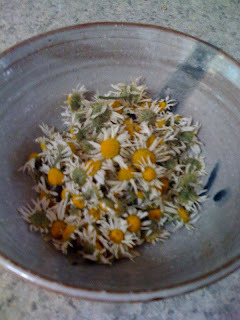 Okay, there are two basic kinds of chamomile: German and Roman (also called "Common"). The German chamomile is an annual, with flat parsley-ish leaves. The Roman is perennial, and its leaves are thinner and more feathery. I have Roman out in my garden, though next year I might spring for some variety and grow both. (In some English gardens, people grow Roman chamomile in place of grass--it's thick and spready and hardy and can even be mowed like a lawn.) Botanical.com has lots more information--I highly recommend it for info about almost any herb. What's weird is that while both the German and Roman versions are highly aromatic and have sunny little daisy-like flowers, and both have similar medicinal applications, they are actually very different plants. (but I'm not going to get into that. Y'all can do your research if you're interested.) Either one is really easy to grow, though--the German from seed, the Roman from sucking it up and buying a plant or two one year, and letting it go gangbusters. Short answer: it needs full sun, but not much else. 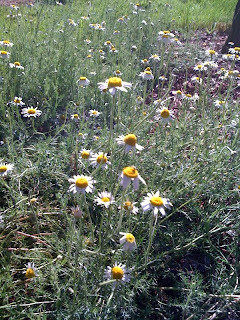 The Roman chamomile, at least, is a real "thrives by neglect" kind of plant. I started last spring with two little plants about 4 inches in diameter...now I have an actual "chamomile patch" about 2 feet across. With lots of cute little flowers. I do absolutely nothing for it. 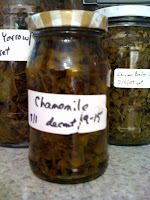 You have three basic applications for chamomile: tea, tincture, or oil. I'll be real honest, I don't care for the tea much--either the sort of bland grassy stuff you buy commercially, or the fresh-flowered kind (which two couldn't be more different)--but it is very relaxing and I think it's worth it. And just because I don't much care for it doesn't mean you won't. You can store the dried flowers in a ziploc or other air-tight container with as much air pressed out as possible; do not crumble the flowers until you're ready to use them, as this releases a lot of the volatiles prematurely. If you don't care for the tea by itself, you could also mix it with some other herb before brewing--like lemon balm (for sleepiness), or a little grated fresh ginger (to settle an indigestiony stomach). Or you could use the tea for some non-oral purpose--put a handful of flowers in a mesh bag into a hot bath, or make some weaker tea as a highlight-inducing rinse for your hair. Tincture is essentially soaking the fresh flowers in a 50% alcohol solution for 6 weeks to...whenever. (I have some from a year ago that I still haven't removed the flowers from.) The combination of the water and the alcohol draw out the key constituents of the plant and convert it to a more easily medicinal and longer-lasting form. I have instructions for how to make it on my own blog, and it's pretty easy, just time-consuming. Tincture is usually taken by putting a few drops (up to a teaspoon) into water or juice and drunk that way; alternatively, it can be mixed in equal parts with honey and taken more like a syrup. The oil I've never actually made myself--but I may try it this year. It's a lot like tincture--you let the flowers dry a little bit just to get the majority of the moisture out, but not more than a day or so, fill a jar loosely with the flowers, and then pour oil (some neutral oil like grapeseed or olive or what have you) over them. Either fill the jar all the way to the top before capping loosely, or place a layer of plastic wrap over the top of the oil, or some people will even gently float half an inch of vodka on top. The purpose here is to prevent any air from getting into your oil but allowing gas or moisture to escape as needed. Set it on a sunny windowsill for a couple of weeks, stirring often with a chopstick. (Or something else, but a chopstick works beautifully.) Strain through cheesecloth, muslin, or even a coffee filter. Now, some people will tell you to squeeze out as much oil as you can from that filter when you're done, but I find that risks getting leftover moisture into your oil and thus increases the risk of mold. Oil and moisture together mean almost certain mold. So at that point in the process, I usually...well...okay, if you want the truth, I decide it's a good time to take a shower, take that filter up with me, and use the oil as a really lovely all-over moisturizer. Trust me, it's nice. Anyway, once you have your oil you could use it for massage, or to put into a bath, or for a really nice hot oil treatment for your hair (chamomile has lightening qualities, so I'm not sure I'd recommend this for serious brunettes), or you could use it to make some kind of gentle skin care salve like diaper ointment or what I call "Preparation Ouch." Remember--Chamomile soothes and relaxes almost anywhere you put it, so hey...go for it! This is very cool info. I'm looking forward to the rest of the series. What do you do with the tincture? Very cool, what a great idea for a series of posts, I can't wait! Oh shoot, I meant to put that info in the OP and must have forgotten...I'll go back and do an edit. 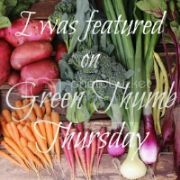 Tincture is best used a few drops at a time in juice or water, every couple of hours as needed. Or you can mix equal parts with honey and take it like a syrup. My kids call chamomile tea "Blumentee" - we pull it out with a touch of honey whenever their tummies are on the queasy side... as my mom did for us! I look forward to your future herb-y posts. Thank you! My son has started drinking chamomile tea at bedtime and I have been thinking about growing it. Does the annual reseed, do you know?